M. Duff, J. Hengst, R. Gupta, D. Tranel, N. Cohen, Distributed impact of cognitive-communication impairment: Disruptions in the use of definite references when speaking to individuals with amnesia. 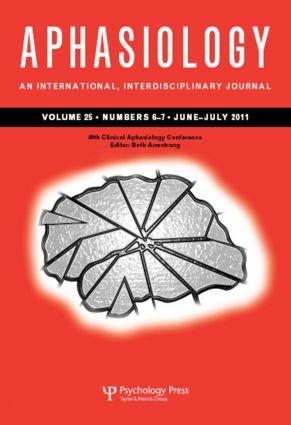 B. Purves, H. Logan, M. Skip, Intersections of Literal and Metaphorical Voices in Aphasia. J. Kurczek, M. Duff, Cohesion, coherence, and declarative memory: Discourse patterns in individuals with hippocampal amnesia. G. Olness, E. Englebretson, On the Coherence of Information Highlighted by Narrators with Aphasia. E. Babbitt, A. Heinemann, P. Semik, L. Cherney, Psychometric Properties of the Communication Confidence Rating Scale for Aphasia (CCRSA):Phase 2. F. Kohen, G. Milsark, N. Martin, Effects of syntactic and semantic argument structure on sentence repetition in agrammatism: Things we can learn from particles and prepositions. K. Le, C. Coelho, J. Mozeiko, F. Krueger, J. Grafman, Measuring Goodness of Story Narratives: Implications for Traumatic Brain Injury. M. Carter, M. Hough, M. Rastatter, A. Stuart, The effects of inter-stimulus interval and prime modality in a semantic priming task. J. Gordon, N.Kindred, Word retrieval in aging: An exploration of the Task Constraint hypothesis. C.Tompkins, M. Blake, J.Wambaugh, K. Meigh, A Novel, Implicit Treatment for Language Comprehension Processes in Right Hemisphere Brain Damage: Phase I Data. R. Hunting-Pompon, D.Kendall, A. Bacon Moore, Examining attention and cognitive processing in participants with self-reported mild anomia. J. Lee, C. Thompson, Real-time production of unergative and unaccusative sentences in normal and agrammatic speakers: an eyetracking study. J. Mozeiko, K. Le, C. Coelho, J. Grafman, F. Krueger, The Relationship of Story Grammar and Executive Function Following TBI. A. Ball, M. de Riesthal, V. Breeding, D. Mendoza, Modified ACT and CART for Severe Aphasia.